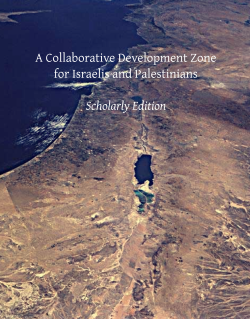 "A Collaborative Development Zone for Israelis and Palestinians"
The text first discusses the underlying situation and then develops the policy proposal - a Collaborative Development Zone ("CDZ", or Green Belt) along the Green Line, based on the portfolio endowment policy. The portfolio endowment policy endows each Palestinian and Israeli with a financial instrument comprised of a portfolio of Green Belt enterprises. Opportunities include agriculture, branding, consultancies, cultural marketables, education, finance, health, international institutes, tourism, utilities and collective endowments such as _natural resources_ The portfolio endowment includes a current interest in future Green Belt enterprises, thereby creating immediate economic opportunity for individual citizens, families and communities. An historical context is included. Losses inflicted by the legacy stalemate are considered in some detail. That perennial stalemate is itself analysed by modelling the confrontation, to help understand why and help lay groundwork to root it out, so that people can enjoy a better future. The genuine collaboration implicit in the CDZ goes hand in hand with a reversal in polarity of the relationship between the two peoples. Such a choice removes the primary roadblock to improvement in genuine quality of life for Israelis and Palestinians, including the protection of mutual core values and the enjoyment of stable security and egalitarian economic development. 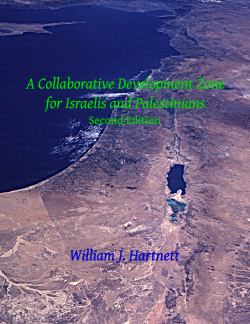 The Collaborative Development Zone is a realistic choice for the two peoples. It is the opposite of attempting to manipulate or conquer using finance or risky mega-projects. Rather the CDZ proposal is premised upon mutual respect and self-determination, parlaying a need to rebuild into an opportunity to advance the pursuit of sustainable development. Instead of "shock doctrine", how about "awesome opportunity"? From previous edition: "This proposal is grounded in finance and in international law. It does not presume to prejudge the relative merits of freely arrived at one- or two-state resolutions. The polarity of the relationship is more important than the quantity of states. It is states which exist for the purpose of serving the interests of individuals, peoples and nations - not the reverse ... The international community has a vital role in regularizing the Israeli / Palestinian situation in accordance with international law, but other countries have no right to usurp Israeli and Palestinian self-determination." Excerpts from earlier edition available from National University of Ireland (search news archive): Social Science Research Centre. Change the world - one book recommendation for your library at a time !